Dear Lizzy layout to share! Hey everyone! I meant to get this post up earlier but blogger was acting really wonky for me this morning. Still is for some reason but I'm sneaking this one in while it's behaving a bit. LOL! This is my first week as blog hostess over on the Pebbles blog and I am loving it. The team is so wonderful to work with and the products are just so much fun! I'll be posting daily Monday through Friday so I really do hope you'll take the time to stop by and leave a comment. And I'll let you in on a little secret ... we'll be hosting our first blog challenge tomorrow so you'll definitely want to stop by then and participate for the chance to win some amazing Pebbles goodies! The theme for this week is "favorites" and it is well known that Lil Buddy is my favorite Pebbles line to date (that might change with these latest releases from CHA ... just sayin' LOL!). I LOVE the color combination of Lil Buddy - I mean who can resist blue, green, and orange all together. Combine that with robots and dinosaurs and you've got a match made in heaven. 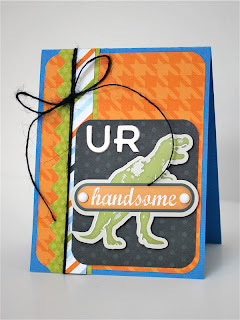 For my project I created this cute card for one of the many handsome men in my life. Now I just have to figure out which one to give it to! LOL! Don't forget to stop back by the Pebbles blog tomorrow to read all about our first challenge! See you there! This is a wonderful card! Love that it's for a boy.